Continuing his discourse on demonic psychology, Maharaj clarified that demons existed in previous ages as well. 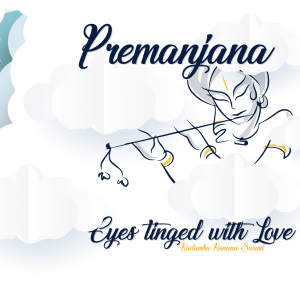 If one reads the beginning of Krishna Dharma Prabhu’s Ramayana, Rakshasas were flying in the sky and then killed saints who were performing sacrifices. They killed the saints mercilessly. This class and yesterday’s has to rank as two of the finest classes Maharaj has ever given, in my opinion. It was a no holds barred, candid understanding of the human psyche, warts and all. 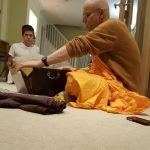 And related directly to devotees themselves, Maharaj really put up a mirror to the devotees of the Iskcon community, the reflection in the mirror isn’t always fair and pretty. But then a Guru’s duty is to cut. And Maharaj wasn’t carrying a poxy, little flick knife; he was wielding a foot long kukri machete, ready to chop up all our misconceptions about ourselves and others. It started with a general study on demons, looking at Kamsa and the Vrindavan demons, their power, attributes and features. How even though they make alliances together, demons deeply hate each other. For example, the Vrindavan demons were never actually friends of Kamsa; they were only his allies because he had defeated them, so it was all fear based. And that’s the key; it’s all based on fear. And Kamsa’s cruelty was magnified by fear. Maharaj talked about Kamsa’s history, being the inauspicious result of an illicit union between Dhrumila and Padmavati. In fact Padmavati, Kamsa’s mother was of a somewhat dubious character, never regretting anything that Kamsa did and always gossiping about Krishna. In the modern age, we often find ourselves in demonic association. Maharaj revealed having a personal friend who he did not even tell that he joined the Hare Krishna’s because he knew the friend go completely crazy. Once when he brought that friend to his house, his mother called him a hawk. Maharaj realised that in a way, she was protecting him. So nowadays, the demonic culture is integrated into society. Hardheartedness and cruelty are predominant. Animal cruelty and organ trafficking, etc. It is all coming from hard heartedness. Maharaj gave the example of Aghasura who was not just a snake but had a human form as well. But he liked the snake form because he was completely cold blooded. All humans were just utensils to him… completely ruthless. He explained that he does a lot of counselling within the devotee community and he routinely gets cases revolving around some form of abuse. It has come to a point where he is like, “Oh no, not again! !” We can say it’s the work of ‘kali chelas’ in the sankirtan movement. But ultimately we are cruel out of ignorance because we are being cruel to our own destiny. This tendency of cruelty is rising out of ignorance and step by step we are going down. Little deviations here and there. That is how it is working. The class was very comprehensive and covered many other aspects and is certainly one of the most powerful and hard hitting classes at the Manor. And yet Maharaj has the uncanny knack of conveying hard truths in such a humorous manner. You would have to hear it to believe it, so please hear it. Comes highly recommended!! It was literally a crawl through the traffic to get to the Crawley program and that too, late in the evening. Maharaj wasn’t exactly over the moon with the timing of this program. Nonetheless he sees a lot of promise with this sanga group and comes here every time he is in the country. But this time, he decided to tell them at the end of the program to adjust the timings, otherwise he won’t be getting back at his house until way after midnight. 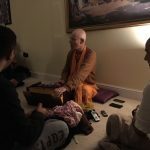 Once Maharaj and his group of devotees got to the event, he started of singing the ‘Jaya Radha Madhava’ prayers and at ‘…Yamuna tira vanachari’ the audience would jump the pause before the first line again. 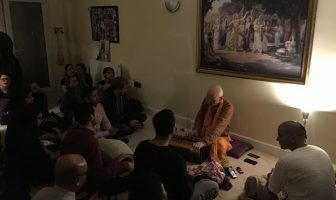 After a couple of times of doing this, he stopped the kirtan and smilingly told everyone to be aware of the pause, otherwise the beat of the tune gets ruined. Everyone laughed. He added, “I’m not going to let you kill the tune!” Cue more nervous laughter. Before resuming the prayers, he also told the mrdanga player to hold in the reins and take it easy, that it was not a horse race where he needs to gallop away with the beats. Because Maharaj said it in such a humorous manner, everyone took it in good spirit and it showed Maharaj to be a true perfectionist. 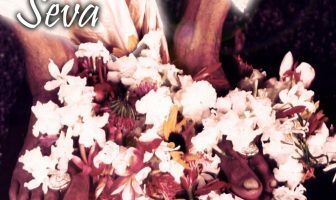 After all a Vaishnava is daksha (expert) in whatever seva he performs. After the prayers, Maharaj started to speak, basing his talk on the esoteric poems of the Padyavali. The main conclusion was that only devotional service counts, nothing else. One of the verses in the Padyavali talked about so many devotees lacking in certain qualities like Kubja who had no beauty, Gajendra who had no knowledge, Dhruva who had no maturity… but in the end, none of that matters; only devotional service counts. 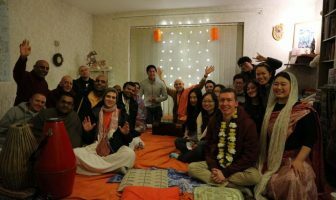 We have to make Krishna the centre of our lives and that means physically as well. 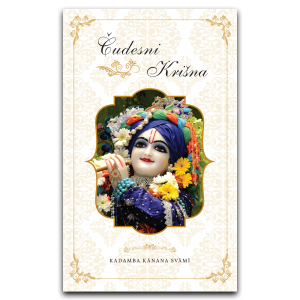 Your Krishna deity should be in the centre of the home, even if it means we have to settle for a small corner in the room. A lot of worshipers themselves are unclear as to who Krishna even is. ‘Nam nam akari bahuda nija sarva shakti….’ But how much do we know of Krishna energies? 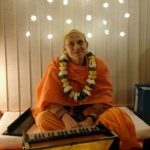 The sankirtan movement is making things crystal clear. Krishna is the original lamp and there is one type of ignorance which is thinking that after getting access to the Absolute Truth, there will be something more. But they don’t realise that beyond that there is simply more chanting. And do we even understand who Srila Prabhupada really is!? Once Malati Prabhu had a dream and a beautiful effluent personality appeared and said, “You have no idea who Srila Prabhupada is. He is being worshipped all over the universe.” It transpired that this personality was a Yamaduta. They are generally perceived as being ugly but to devotees this is what they like. 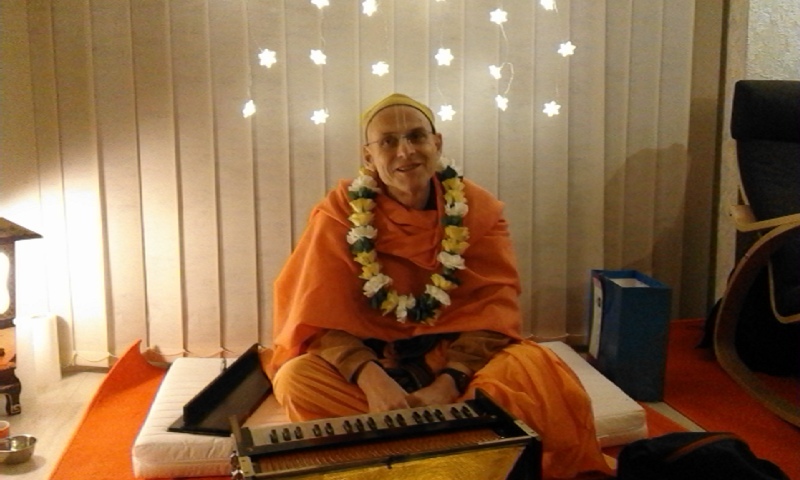 Maharaj urged all the devotees to really think about how unique Srila Prabhupada is. 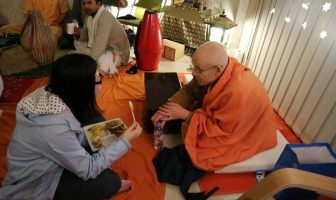 He spread the sankirtan movement once in a lifetime of Brahma! 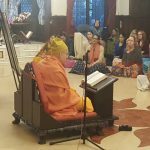 Trivikrama Swami expanded the whole vision of Srila Prabhupada by questioning whether Srila Prabhupada really did go back to Godhead after leaving here. This was in 1979 in Vrindavan and the devotees were alarmed. What was Maharaj saying? 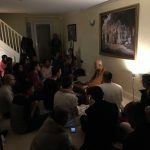 And then Maharaj released the bombshell, “Maybe he has gone to another universe to start the whole thing again?” Maharaj recalled how when the devotees heard this, they were fainting. 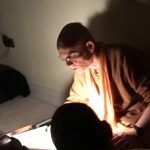 How much do we really know Krishna and Srila Prabhupada. 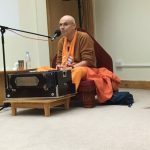 Maharaj spoke on and raised some fantastic points and shared some profound realisations. HH Kadamba Kanana Maharaj Ki Jai! Im sorry, could you please tell us where can we listen to these classes?